As we increasingly look at our human capital to assess where we have been, where we are now and where we are going, it is probably helpful to consider the current overall understanding of human consciousness. That is no easy task. The vague and varied nature of the human mind can be challenging to comprehend. It is not always readily visible, measurable or observable, although outward behavior and appearance stemming from consciousness is. In our everyday lives, we can look at elements of society such as economic development, educational systems, health care, defense and intelligence activities, cultural creativity and social cohesion that reflect the current state of our comprehension of human consciousness. At the heart of these endeavors is human consciousness, so trying to understand and optimize it seems worthwhile. When we consider deploying communication, information and education about consciousness, domestically or in the context of international soft power or smart power, what are some of the elements involved? Although there are indications that consciousness itself can be utilized in interesting ways, more likely we are generally referring to practical and deployable communication, information and education about it. It is the development and understanding of a perspective on the human race and the current state of our societies and our world. By using the viewpoint on and of human consciousness, we might be able to transcend many obstacles to problem-solving, rapport-building and creative, innovative approaches and solutions. So what is particularly interesting about consciousness that might arouse the interest of average people, friends and adversaries? First, we all have it. We can call consciousness the human mind, human psychology, awareness, perception or even a spirit or soul, depending on our perspectives and what elements we are discussing. There are a few interesting aspects to consider. One is that, generally, it is accepted in mainstream psychology that we have a conscious mind, a subconscious and a border area between the two. In addition, various kinds of philosophies, spiritual beliefs and some significant modern research make reference to the connection between an individual person’s mind and a larger power, force, intelligence or field of some kind. Many different names are given to this in different cultural, philosophical and scientific contexts. Another fascinating topic is the indication that human consciousness has a “sixth sense” that can pick up information and understanding that is not available to our other five senses of sight, hearing, touch, smell and taste. The sixth sense can bubble up from the unconscious and enter into the conscious. We might call it intuition, instincts, hunches, gut feelings or something else. This might manifest itself in our nighttime dreams or even daydreams as the unconscious becomes more active in relation to our conscious logical-thinking brains. In his 1972 book The Natural Mind, Andrew Weil, M.D., hypothesized that the human mind may have a natural inclination to seek understanding of a wider and deeper consciousness because the mind knows there is more to itself – and more to a possibly larger cosmic mind. Optimizing our understanding of these and other elements of human consciousness and behavior through communication, information and education might be helpful in wide and deep ways. Although human consciousness is not always easily understood or measured, we know that as a general concept, it includes thoughts, feelings, emotions, dreams, beliefs, perceptions, awareness and similar kinds of characteristics. And now that we suspect, based on credible research, that human consciousness also probably has abilities to tap a sixth sense, this adds to our more conventional understanding of ourselves and others. A natural question may arise as to if it is wise to inform troubled people or international adversaries that their minds and consciousness might be worth exploring further along these lines. One answer to this may be that research into human consciousness and even “anomalous” abilities such as the sixth sense (which actually are probably very natural and normal) are almost common knowledge nowadays. We find information on this in books, movies, articles and all over the Web. The information is in the public domain or what is sometimes called open source intelligence. When the U.S. Government’s defense and intelligence communities started researching this in the 1970s, it was in response to the old Soviet Union’s activities in these areas. China has also reportedly conducted research on human consciousness and human abilities along these lines. We might take a leap of faith and assume that as people understand themselves, their social and psychological programming, their own personal histories and the deeper and transcendent nature within and around them, they will grow as constructive human beings. 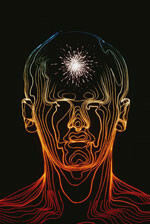 In fact, some of the research in human consciousness seems to include a faith-based component. That is, when we try to understand deeper possible realities – whether using psychology, spirituality, biology, quantum physics or other methods – things sometimes get mysterious and not necessarily logical. Unusual phenomena, synchronicity (odd and meaningful coincidences) or other things that seem to be authentic and can be perceived by us might sometimes occur. If we try our best to understand, communicate and educate ourselves and others about some of the emerging and leading-edge developments regarding human consciousness, we might be able to optimize these real resources and assets. Steve Hammons writes on a variety of topics. His work appears on transformational websites and at his blogs Joint Recon Study Group and Trancendent TV and Media. He’s also authored two novels, Light’s Hand and Mission Into Light. Previous Previous post: Financial Zen: Why Do Bad Things Happen To So Many Good People?